Algonquin Studios is a professional services firm providing software development, IT services, web content management, web design and technology consulting since 1998. Our business and technology solutions solve problems for companies from many industries including legal, health care, financial services, and not-for-profit. We have offices in Buffalo, NY and New York City. MVC has become a very popular abbreviation lately, especially among web developers – and for a very good reason. MVC stands for Model View and Controller, and it is basically standardizing modern web application across platforms and languages. The MVC architecture uses what is called the DRY (Don’t Repeat Yourself) philosophy, and has succeeded in taking an object oriented approach in making web applications development elegant and powerful while being easy for multiple developers to maintain. The Model of the MVC architecture is basically the object. For example, if you were building an application that kept a record of employees in a database the Employee would be the Model. The Model is also the portion that is intended to work directly with the database. The Controller portion of the architecture is the glue that holds it all together. The controller is what interacts between the Model and the View. The controller will often contain business logic, call functions that interact with database from the model, process the forms, and handle all of the redirections. An MVC architecture is available in virtually all platforms and languages. Microsoft is up to version 3 of their MVC architecture and it is available for developers to use right now in MS Visual Studio, supporting both C# and VB in .NET. There are also a myriad of Open Source MVC architectures available for free that run on *nix systems. Ruby on Rails has gained a great deal of popularity in the recent years. Django is another elder MVC web application framework written in Python that has also had a cult following. CakePHP and Symfony are two of the more popular PHP MVC frameworks that many PHP developers prefer to use in modern application development. While there are many legacy applications out there that probably have several years left in their lives, applications using the MVC framework will quickly become the norm and a standard skill that employers will be seeking. When we choose which web sites, blogs, and newspapers to read and which television stations to watch, we are knowingly filtering the information we receive. But what we may not realize is the the explosion of personalization on the internet is doing the same thing. But how personalized are things really? More than you may think. Recent peer reviewed research shows that Google will return search results that vary from user to user by up to 64% (First Monday.) Or consider the difference between stories that appear in the “Most Recent” view of Facebook’s news feed as opposed to what it determines is “Top News” for you? In a past interview with New Scientist magazine, Eli Pariser – board president of MoveOn.org, says that Facebook and Google now act in the same fashion as editors… highly personalized editors that reinforce what we already believe and limit our exposure to new ideas. His new book The Filter Bubble addresses the concerns around these issues and offers tips for busting your own filter bubble. Stop fearing technology and solutions that are not open-source! There, I’ve said it. Why? Read on. Far too many companies, savvy marketers and salespeople continue to evangelize open-source as the alternative to being taken to the cleaners with a proprietary solution. Enough already! My follow-up question is usually about their use of MS Word, (for example) but the list can go on and on. For all you MS Word users out there who actually paid money for the software, are you aware that you don’t own it? You own a license to use a specific version, or versions, in perpetuity. However, you have no right whatsoever to change, revise, use in manners other than intended, re-purpose or resell that software, because you don’t own it. How many of you, now that you know that, are going to stop using it? I suspect somewhere between none and zero. Why? Because it’s not really about open-source or propriety at all. Those who mislead about the virtues of open-source vs. proprietary aren’t always addressing the right issues. Typically, customers are reticent about a solution because of the service or lack thereof that they have received in the past from a service provider. It’s rarely a true technology issue so much as it is a service and expectation management issue. Unfortunately, for companies that use more mainstream corporate technologies (Microsoft .NET, MS Visual Studio and MS SQL Server as examples), there are so many examples of poor service and poor execution of technology that it’s easy to fall victim to the broad brush-stroke that is anti-proprietary. If you’re the average consumer, that may look and sound great. It may resonate with you because the solution above is “universal” and “you’ll own every element” of what’s produced. Here’s the problem, from someone who is in the business – it’s marketing speak and full of holes. Beyond the fact that it’s entirely void of details in terms of process and real technology, it’s as much a policy issue as it is a technology issue. I know of many web site platforms that are not open-source, but where you own your site 100% no questions asked. Good service companies stand behind policies that like because they provide good service. They don’t need to own your intellectual property – that’s nuts! It’s not a technology issue – it’s a policy and service issue. By the way, companies who use open-source tools can provide bad service just as easily as companies who don’t use open-source tools. There are many other myths to address in another post. The myth of “free” is a favorite of mine, but one that I’ll save for another day. Ask questions. Make sure that a service provider is willing to educate you and your team, work with transparency in terms of process, address your concerns and always answers your questions. Unless you have a real business need that dictates the use of an open-source technology, be open to other solutions. 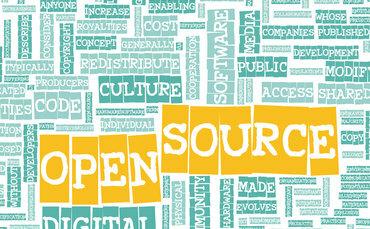 In the end, proprietary is not bad or evil, and neither is open-source. It’s almost never the technology that’s at issue, but the service behind the technology. Algonquin Studios will now be blogging on a regular basis. We will have multiple contributors from many different departments and view points. We may even have some guest and client blog posts so be sure to check back regularly or subscribe to our RSS feed for the latest and greatest. Be sure to leave ideas for topics you’d like to see covered in the comments.